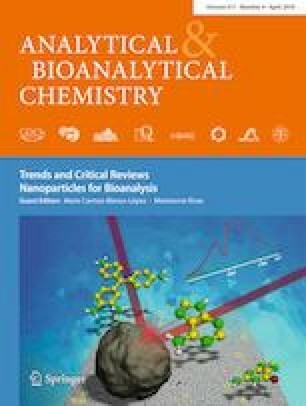 Here we describe a simple approach for the simultaneous detection of multiple microRNAs (miRNAs) using a single nanostructured reagent as surface plasmon resonance imaging (SPRi) enhancer and without using enzymatic reactions, sequence specific enhancers or multiple enhancing steps as normally reported in similar studies. The strategy involves the preparation and optimisation of neutravidin-coated gold nanospheres (nGNSs) functionalised with a previously biotinylated antibody (Ab) against DNA/RNA hybrids. The Ab guarantees the recognition of any miRNA sequence adsorbed on a surface properly functionalised with different DNA probes; at the same time, gold nanoparticles permit to detect this interaction, thus producing enough SPRi signal even at a low ligand concentration. After a careful optimisation of the nanoenhancer and after its characterisation, the final assay allowed the simultaneous detection of four miRNAs with a limit of detection (LOD) of up to 0.5 pM (equal to 275 attomoles in 500 μL) by performing a single enhancing injection. The proposed strategy shows good signal specificity and permits to discriminate wild-type, single- and triple-mutated sequences much better than non-enhanced SPRi. Finally, the method works properly in complex samples (total RNA extracted from blood) as demonstrated by the detection of four miRNAs potentially related to multiple sclerosis used as case study. This proof-of-concept study confirms that the approach provides the possibility to detect a theoretically unlimited number of miRNAs using a simple protocol and an easily prepared enhancing reagent, and may further facilitate the development of affordable multiplexing miRNA screening for clinical purposes. Andrea Sguassero and Álvaro Artiga contributed equally to this work. The online version of this article ( https://doi.org/10.1007/s00216-018-1331-0) contains supplementary material, which is available to authorized users. The authors thank Dr. Domenico Caputo for subjects’ recruitment and for his support for clinical aspects. They also thank Nicholas Corneli for his support for spotting and buffer optimisation. The authors gratefully acknowledge “The Advanced Microscopy Laboratory” (INA-Universidad de Zaragoza) for access to their instrumentation and expertise. They also thank J.C. Raposo of the Servicio Central de Análisis de Bizkaia from SGIker of Universidad del País Vasco (EHU) for the ICP technical support and J. Puertas of the Radioisotope Service of Universidad de Zaragoza for the radiolabelling technical support. Research funding was provided by the Italian Ministry of Health within the framework of the European EuroNanoMedII Project (Call 2015) entitled “NanoPlasmiRNA”; DGA-FSE (Diputación General de Aragón–Fondo Social Europeo); Ministerio de Educación, Cultura y Deportes of Spanish Government, FPU grant (FPU014/06249). Healthy control subjects were involved in the study. Three subjects have been enrolled at IRCCS Fondazione Don Carlo Gnocchi. These subjects gave written informed consent in accordance with the protocols approved by the ethics committee of the same institution and according to the principles of the Declaration of Helsinki. Kappel A, Keller A. miRNA assays in the clinical laboratory: workflow, detection technologies and automation aspects. Clin Chem Lab Med. 2016; https://doi.org/10.1515/cclm-2016-0467.